The Fourth of July in Avon culminates in a huge fireworks display at 9:45 p.m., with 10,000 shells exploding in a pyrotechnic extravaganza of color and sound. Schedule is subject to change; visit www.vailamericadays.com for current details. 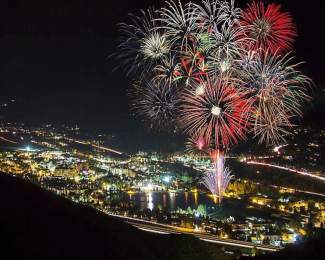 Up and down the valley, Eagle County communities are gearing up to celebrate Independence Day with parades, carnivals, family-friendly events and, of course, fireworks. Here’s a roundup of the biggest happenings from Vail to Gypsum. The 30th annual Centura Health & NexCore’s Salute to the USA presented by The Westin Riverfront Resort & Spa takes place on Sunday starting at 5 p.m. in Harry A. Nottingham Park in Avon. The event includes free family-friendly festivities throughout the park, with face painters, fire jugglers, stilt walkers, balloon sculptors, magicians and more. Bring a blanket and find a seat in the grass to chow down on festival-style food favorites from fresh-squeezed lemonade and funnel cakes to mini-donuts and roasted ears of corn. The day culminates in a huge fireworks display at 9:45 p.m., with 10,000 shells exploding in a pyrotechnic extravaganza of color and sound. Stand-up paddleboard and paddleboat rentals are available from the beach area until 2:50 p.m., and there will still be public access to the north side of the park, the beach and sand volleyball courts via the Lake Street north entrance, West Beaver Creek Boulevard entrance and west entrance near Avon Elementary School. Parking is extremely limited, and the town encourages families to walk, ride their bikes or take public transportation to the park. Bags and coolers will be checked at all festival entry points for alcohol (no outside alcohol allowed) starting at 9 a.m., and pets are not allowed in the park after 2 p.m.
Click on “Upcoming Events” at http://www.avon.org for more information about Salute to the USA, including notes on parking and road closures. This year’s Fourth of July celebration in Beaver Creek starts at 11 a.m. Monday with Beano’s Cabin’s 23rd annual July 4th Clambake. Tickets are $75 for adults, $30 for children ages 6 to 12 and free for kids 5 and younger and include a mid-mountain barbecue and seafood buffet with live entertainment and lawn games for all ages. Shuttles will run continuously from 11 a.m. to 1:30 p.m., with the last download at 4 p.m. Reservations are required; call 970-754-3463. At noon, the gates open for Stars, Stripes & Slides, with games, giant slides, bounce houses, face painting, obstacle courses, arts and crafts, toddler inflatables and more until 5 p.m. at Centennial Park (at the base of the Centennial Express Lift behind the Beaver Creek Chophouse at the top of the escalators). Activities are free to the public, with a signed waiver. Another Kids’ Zone will be open from noon to 8 p.m. just off Beaver Creek Plaza at the top of the main water fountain in front of Ford Hall. The Kids’ Zone will include carnival games, face painting, arts and crafts and Tumble Bubbles. All activities in this zone are free, with the exception of Tumble Bubbles, which are $10 per ride. Starting at 2 p.m., 8100 Mountainside Bar & Grill will host its thirdannual Fourth of July Lobster Boil at Centennial Park, with $29 plates of lobster, clams, corn, sausage and potatoes, or head to the restaurant in the Park Hyatt Beaver Creek for a summer-inspired buffet, with chilled seafood bar, carved-to-order smoked prime rib, fried chicken and other holiday items for $36 for adults or $18 for children younger than 12. Colorado native Tyller Gummersall takes the stage at 2 p.m. at Centennial Park, performing tracks from his new album “Long Ride Home” and hometown-inspired anthems such as “Colorado Rain.” Oregon’s Jackson Michelson follows at 4 p.m., with a mix of feel-good tunes with a bit of Southern twang. Redhead Express, a four-sister group from Alaska, performs at 6 p.m. playing fiery melodies on fiddle, banjo, mandolin and bass. Country star Jerrod Niemann headlines the Fourth of July celebration at 8 p.m. The Kansas native will play chart-topping summer jams such as “Lover, Lover,” “Drink to That All Night” and “Blue Bandana.” In addition to writing tracks of his own, Niemann has written numerous songs for Garth Brooks. To end the night, a fireworks display will light up the sky at 9:30 p.m. If you’re looking for activities for the young ones prior to noon on the Fourth of July, then the Summer Adventure Center is open from 9:30 a.m. to 8 p.m., with paid activities including gem panning, ropes course, bungee trampolines, climbing wall and mini golf. For more information on the Independence Day celebration in Beaver Creek, visit http://www.beavercreek.com or call the Beaver Creek Information Center at 970-754-4636. The towns of Eagle and Gypsum will celebrate togetherness on Independence Day. Earlier this year, the town board members from both communities agreed to pool resources for the July 4 fireworks show, and Gypsum will host the 2016 celebration. The traditional Eagle July 4 Bike Parade is still planned for the morning of Monday. Participants will gather at the Brush Creek Park at 8 a.m. for the ride to Eagle Town Park. The parade will begin at 8:15 a.m. Once riders arrive at Town Park, they will enjoy treats and games. The party in Gypsum will get under way at 7 p.m. Monday at the Lundgren Theater Park. Santana tribute band Soul Sacrifice will perform, and the town will provide free hot dogs, popcorn and ice cream, served by members of the Gypsum and Eagle town boards. Inflatable bouncy houses and face painting will be set up for kids. When the sky darkens, a fireworks display, synchronized to music, will be presented. For many years, Eagle and Gypsum have partnered financially on the fireworks over the Eagle County Fairgrounds. This year, the towns agreed to continue the financial partnership and to alternate locations annually, with this year marking the first time that Gypsum will host the event. For people traveling to Gypsum for the fireworks show, be advised Cooley Mesa Road will be closed from Valley Road to Jules Drive from 5 to 10:30 p.m. No parking will be allowed at the Gypsum Athletic Fields Complex. Parking will be available at the Gypsum Town Hall/Gypsum Recreation Center campus, as well as at Eagle Valley High School. Eagle residents who would prefer to leave their vehicles at home can take advantage of special ECO transit bus runs. ECO buses will stop at the Chambers Avenue Park and Ride at 6:08 p.m., Eagle Town Park at 6:11 p.m. and U.S. Highway 6 and Sylvan Lake Road at 6:13 p.m. Buses back to Eagle will depart from Eagle Valley High School at 9:15 p.m. and 10 p.m.
Festival participants are reminded that the town of Gypsum prohibits dogs and glass containers in town parks. For additional information, visit http://www.townof gypsum.com and http://www.townofeagle.org. Vail America Days, Vail’s event-filled Fourth of July celebration, will return to Vail Village and Lionshead Village on Monday The event begins with the annual Fourth of July parade, with live musical entertainment throughout the weekend, including the annual Bravo! Vail Patriotic Concert with the Dallas Symphony Orchestra and a traditional fireworks display at Golden Peak. “The Spirit of America” themed parade will begin at Golden Peak at 10 a.m. on Monday, and will wind its way through the villages to Lionshead, attracting thousands of spectators. The town of Vail has announced Vi and Byron Brown as the parade marshals for 2016. The Browns have been a part of the Vail community for more than 50 years; they’re a quintessential Vail couple, complete with a “how we met on the slopes” story. They have been involved in the development of the town of Vail in many ways, from building and living in the first house in West Vail to fundraising for local education, construction and other nonprofit organizations and also helping to bring the 1989 Alpine Ski World Championships to Vail. Vi and Byron Brown played crucial roles in both the expansion of the Eagle Valley Community Fund, as well as the advancement and success of Ski & Snowboard Club Vail. Their son Mike Brown was the first Vail athlete to join the U.S. Ski Team and was recently inducted into the Colorado Ski & Snowboard Hall of Fame. Entrenched in Vail’s history, this couple represents the spirit of Vail and a love for skiing and the culture surrounding the sport. At 2 p.m. on the Fourth of July, the annual Patriotic Concert performed by the Dallas Symphony Orchestra, presented by Bravo! Vail and the Vail Valley Foundation, will take place at the Gerald R. Ford Amphitheater. All pavilion tickets went go on sale Friday at 8 a.m. Each purchaser is limited to four tickets at $25 per ticket, and tickets will be available only to walk-up customers at the Gerald R. Ford Amphitheater Box Office. All proceeds will benefit the Vail Veterans program. New this year, the town of Vail will host kids’ activities at the Children’s Fountain in Vail Village on Saturday from 11 a.m. to 1 p.m. and at the Sunbird Park in Lionshead Village on Sunday from 11 a.m. to 1 p.m. Kids interested in taking part in the parade on Monday are invited to visit the Supergoop! Kids SUNsational Activity Stations to have the opportunity to craft their own Supergoop! hat as their entry ticket to walk in the parade. The celebration in Vail culminates with a fireworks show at Golden Peak on Monday at dusk (conditions permitting). The fireworks will be synchronized to a powerful musical soundtrack, and the show is suitable for all ages. The use of all personal fireworks is prohibited. For updates on possible fire restrictions or other public safety announcements, subscribe to the emergency notification system at http://www.ecalert.org to receive text or email alerts on your phone. For more information about Vail America Days, visit http://www.vailamericadays.com or call Highline Entertainment at 970-476-6797, ext. 712.